How do you prepare a sermon? What is your process? All pastors develop a collection of resources for their sermon prep. We have commentaries, word study books, Bible dictionaries, and handbooks. We have software that puts all our resources on one screen. We develop a plan for putting the sermon together. Some build out their main points first. Others may work on the introduction and carry on from there. Every pastor has a unique way of constructing a sermon. In this article, I want to back up a bit. This post is not about sermon construction. This is not steps 1 through whatever in preparing a sermon. This is about step zero. Before you prepare a sermon, there’s got to be a sermon idea. Before digging into your resources, you have got to know what you are digging for. What is your sermon topic? What are you preaching on? As a young pastor, my first sermons usually came from my favorite Scripture passages. But after a bit of time, those ran out. I was then faced with the question: What will I preach on next? Where will the next sermon come from? If those questions sound familiar, I hope the remainder of the article will help you find those next sermon ideas. What I list below are what I believe to be three critical sources for finding sermon topics. I’ve used the acronym “BOP” to remember the sources. I know, it’s a terrible acronym but is memorable. This should be a given. The best and only true source for sermon ideas is the Word of God. The Bible informs us of who God is, what His purposes are, and what He wants to do. In turn, this information leads us to what God has to say to His people. As His representative in the pulpit, we relay the message He gives us through the Bible. Our sermon topics come from the Bible. Which means, of course, we have to be reading the Bible. Pastors are busy. I know. 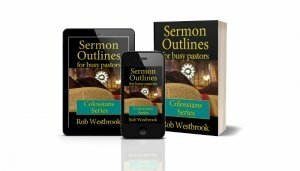 You’re on the Busy Pastor Sermons website and my books are in the series Sermon Outlines for Busy Pastors. However, busyness is never an excuse for not being in the Bible. The work of the pastor is unique from any other profession in the world. There are many reasons why, but one that stands out is our need to sometimes be alone. At least some time away from other people. Pastors need some “me and Jesus” time. In the Word. Everyday. You cannot preach the Word if you are not in the Word. I know it sounds preposterous, but sometimes pastors neglect regularly reading the Bible, whether by choice or circumstance. There have been times in my ministry when I was so busy doing other “pastor” things, I neglected to read the Bible consistently. There have been other times when I was so spiritually dry, I looked for excuses to avoid reading. Sermon topics come from the Bible. Here are a few suggestions for incorporating Bible reading into your life every day. This is my favorite way to spend time in the Word. Find a reading schedule you like. I like the schedules where the daily reading includes passages from both the Old and New Testaments. This page at Bible Study Tools has over a dozen different daily Bible reading plans. If you have a smartphone, get the YouVersion app. YouVersion literally has hundreds of Bible reading plans. I have put together the Read Through the Bible in a Year Journal with a schedule for reading from Genesis to Revelation. Start with Matthew 1 and finish up in John. A variation I’ve used is to read 2 chapters of Matthew, 2 chapters of Mark, 2 chapters of Luke, and 2 chapters of John every day. Of course, they don’t sync up very well chronologically, but it is an interesting way of getting a full picture of Jesus every day. Most epistles are relatively short, with no more than 6 chapters. Don’t just read the epistles of Paul, but include Peter, John, and Jude. Many times expository sermon series ideas come from these readings. I love the Psalms. God never fails to speak through the Psalms. You can combine the reading of Psalms with other daily plans. Many Bible reading plans include 1 Psalm every day in its schedule. 31 chapters, 31 days in a month. Sometimes. No matter the number of days in the current month, reading Proverbs daily is good practice. The book is so practical for our lives. The idea is not just to check off a box that you completed your reading. The hope is the more you are in the Word, the louder God will speak. Sermon topics and ideas come from intentional time in the Word of God. Make this a priority in your step zero sermon prep. Need help preparing your sermons? Here is a template for your sermon preparation. This worksheet will help guide you through building a sermon. Observe people. If you are a pastor, observe your people. If you’re not yet a pastor yet, observe the people you are around most: your family, friends, co-workers, neighbors, etc. What is going on in their lives? What do the people you are around most need to hear from God? Now, this idea might be controversial. I’ve seen and heard comments that needs-based sermons are not the way to go. They are people-centric versus a proper sermon that is God-centric. They are “woo-woo” sermons only used to ease people’s convictions and devalue the consequences of sin and repentance. That’s not my purpose. Let me explain. You are a preacher. You proclaim the Word of God to people who need to hear from Him. They NEED to hear from Him. They come to church to hear what God has to say to them. They are not there to hear what you have to say to them. If all you’re doing is telling people what you want them to hear, you are not preaching. That’s not a sermon – that’s a speech. That is a speech devoid of the power of the Holy Spirit and hindering Him in doing what only He can do. Change people. Most people in the service want to hear from the Lord. Even if they don’t want to hear from God, they NEED to hear from God. There is that dichotomy between wants and needs. There may be a couple in your service who are living together, though they are not married. What they want to hear is that God is OK with their situation. That the Lord understands they are as good as married and, in the end, love is all that matters. What they NEED to hear is what God’s Word has to say about His love, grace, and mercy. And God’s commandments and judgment. Pastors, we preach the truth of the Bible and let the Holy Spirit work. The “O” of observation is not divorced from the “B” of the Bible. These sources of sermon ideas and topics are not “or’s” but “and’s.” They work together. The Bible informs our observation. Here are some ways of observing people and discovering what they need. Sometimes, pastors are guilty of hearing people but not really listening. While people are talking to us, we’re already thinking ahead to what we need to say. We’re trying to come up with the answer we’re supposed to have because, well, we’re pastors. Take time to listen. Not only to what’s being said but also to what’s not being said. Dig past the “want” to the “need.” Listen. Listen to the news. Even if they don’t lean in your political direction. You’ll get a snapshot of the culture and the deep needs our society has today. Let God lead you to the answers this culture needs. Take observation to another level by adding more eyes. Pastors can easily find themselves in the “church” bubble. We’re usually surrounded by Christian people, Christian programs, and Christian people. We can easily lose touch with the world outside the church. Ask people what they face. What do they see in their spheres of influence? What are their challenges in living their everyday lives in full obedience to the Lord? In other words, observe people. Here’s a good experiment. Go to your local mall and sit down with the other men waiting on their wives. Watch people. Watch couples. Watch the older people. Watch the teens. You’ll get an education in culture. Watch your people at church. How are they fitting in with everyone? How are they reacting to those who are new? Watch the people who try to slip in and slip out without interacting with anyone else. Watch. Nobody knows better what is going on in your life than you. People may think otherwise, but pastors face the very same joys and pain as everyone else. Because of the intense spiritual warfare, maybe we know the pain more. If you’re facing something, it’s almost guaranteed someone else in your church is facing it, too. How does what you have read in your daily Bible reading speak to what you have observed? I’m always amazed at how God takes the passages I’ve read and show me their applications in people’s lives. How they apply to my own life. Sermon topics and ideas come from a combination of reading the Bible and observing the needs of the people. Here’s an image that presents Step Zero graphically. You can share this infographic on your social media by hovering over the image and choosing your social media platform. Prayer is listening to the voice of God through the Bible and responding back to Him. It is the other half of the conversation. We consistently read the Bible. We observe the people around us. Then we talk to God about how it all fits together. He leads us to the answer. That becomes our sermon idea. Step Zero is complete. I’ve written about prayer in sermon preparation. You can read that blog post here. Here’s some guidance for prayer when finding a sermon idea. Pray that your heart will be open to the Lord’s direction. Let God show you the meaning of what you are reading. Pray that you will only see what He wants you to see and that you won’t read into it what you want it to say. Pray that God will give you the ability to observe well. Pray that you see the needs of your people. Pray God will let you see which Scripture He wants you to use to speak to their needs. Pray that the people who will hear will be open to what the Lord has to say. Pray they will know God better and please the Lord as they apply what He has to say to their lives. Sermon topics come from a deep dive into the Bible, seeing the needs of the people, and praying for God’s guidance and direction in meeting those needs. The Bible, observation, and prayer. That’s where sermon ideas originate. How do you develop sermon ideas? Does the process I’ve described look similar to yours? What do you think about BOP? Share your comments and your own suggestions with us in the comments below.